FROM I-95 Take Martin Luther King Blvd. exit and turn right on to Lancaster Avenue. Take the first right, South Justison Street. The museum is on the left after the first traffic light. Single tickets are $8.75 per adult/child (under 12 months free). Museum memberships are also available. This family attraction aims to build imaginative minds through play, math, science, and technology-based informal learning. 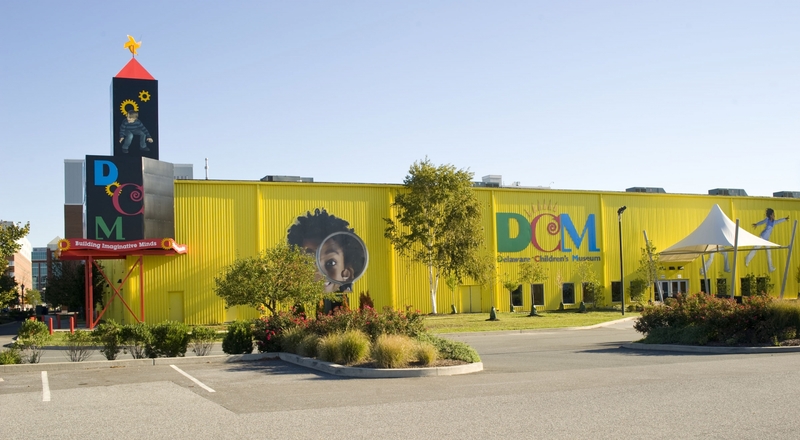 With seven incredible exhibits and over 37,000 square feet of interactive, hands-on activities, the DCM is a place where kids can be kids and the grown-ups in their lives may just get to have all the fun. We’re out to open new worlds for our kids. Developed with the indispensable advice of the country’s leading children’s museums, our exhibits are designed by one of the nation’s foremost museum designers to hold the interest of kids of every age – from toddlers to preteens – with fresh things for them to discover as they grow. Education through playful learning is a key component of our museum. Playful learning is about children developing their physical, cognitive and emotional strengths through imagining and role-playing. The museum’s exhibits are utensils that will help children develop their creativity and problem solving skills, all while having fun and learning new knowledge. DCM includes unique space for birthday parties; camp visits, school trips, and overnights too. Now all we’re missing is you. In the Delaware Children’s Museum, a 30-foot climber will greet guests. This is the Stratosphere exhibit, a place for children to climb up, down, and all around. The Structures exhibit is an exciting place where children will learn about various components and careers associated with architecture and engineering. What makes the heart pump? How does my brain tell my muscles what to do? Well, The Power of Me exhibit will answer these questions and more. ECOnnect allows for children to discover the wonders of nature in a Delaware-centric space. Children will challenge their math and money skills in Bank on It. This is a place where children can explore aspects of money management. And younger children will particularly enjoy Training Wheels, a transportation themed area with a boat, car, and train for kids to explore.